This management agreement form is designed to document the management of a hospitalist doctor group practicing medicine managed by a medical practice manager. The manager is paid on a quarterly basis based upon a percentage of the gross revenues of the practice. This agreement would be suitable for a doctor manager relationship for any medical specialty. 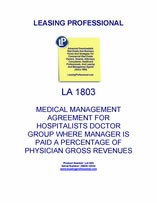 The agreement specifies the authority and responsibilities of the practice manager for the administration and business management of the medical practice, which include arranging for equipment, supplies, non-physician personnel pursuant to specified standards, provision of office space, financial record keeping, and patient billing and collection, among other duties. The practice manager is also responsible for the selection, installation and operation of certain database software to record clinical and financial information for the doctor group. The physician group is responsible for the practice of medicine under the agreement. This Medical Management Agreement (“Agreement”) is made and entered into as of this _________ day of __________, 20__, by and between Medical Management Specialists, Inc., a _________ corporation (“Manager”), and Quality Practicing Hospitalists, a _________ medical corporation (“Group”). A. Manager is a _________ corporation engaged in the business of managing physician practices to enhance the quality and efficiency of the medical practices it manages. B. Group is a _________ medical corporation that provides hospitalist services to inpatients at hospitals staffed by Group. C. Group desires retain Manager to provide assistance to Group in managing and administering all non-medical aspects of Group’s medical practice in a manner and to the extent permitted by law. D. Group and Manager recognize that Group has sole responsibility for providing medical services to Group’s patients, and Manager shall provide assistance to Group in managing and administering all non-medical functions of Group’s medical practice. (a) Business Matters. Supervising and coordinating all day-to-day, non-medical business aspects of Group’s Practice. (b) Supplies and Equipment. Ordering and purchasing, after consultation with Group, all medical and office supplies and equipment required by Group in connection with the operation of Group’s practice. All such supplies shall be of a quality acceptable to Group. (c) Bookkeeping. Providing all bookkeeping and accounting services, including, without limitation, maintenance, custody and supervision of Group’s business records, papers and documents, ledgers, journals and reports, and the preparation, distribution and recording of all bills and statements for professional services rendered by Group in the course of Group’s Practice. (d) Management & Clinical Information Systems. Upon request and in consultation with Group, the planning, negotiation with third party vendors, selection, installation and operation of appropriate hardware and software (including but not limited to the __________ database technology) to provide Group with management and clinical information systems support. All clinical and financial data pertaining to Group’s practice shall be regularly backed up on electronic media, with additional hard copy back up when in the judgment of Manager, after consultation with Group, it is prudent to do so, and copies of such back up data in both electronic media and hard copy shall be provided to Group from time to time upon request of Group. Upon termination of this Agreement for any reason, all such data and back up data shall be promptly delivered to Group to ensure continuity of Group’s financial and clinical operations. All such services shall comply, as appropriate, with the Health Insurance Portability and Accountability Act of 1996, and the regulations promulgated thereto (“HIPAA”). (e) Billing & Collection. Subject to Section 3(d) below, providing all billing and collection services for Group’s medical practice. All billings shall be accurate and in accord with appropriate and up-to-date payor coding requirements. Manager shall diligently pursue collections of Group and shall follow up billings in a timely fashion to ensure that payments are received to the greatest extent possible in a commercially reasonable time, and that aged accounts receivable are maintained within commercially reasonable limits, for medical practices similar to that of Group. (i) Attorney-In-Fact; Assignment and Limitations. In performing its billing and collection duties hereunder, Manager shall act as Group’s agent and shall indicate it is billing in the name of Group. Group hereby appoints Manager, for the term hereof, as its true and lawful attorney-in-fact, with full power of assignment and substitution, to bill patients or third party payors on Group’s behalf; collect accounts receivable arising out of billings, and receive payments on behalf of Group. Notwithstanding the foregoing, no assignment shall be made to Manager of any sums or rights to payment, the assignment of which is prohibited by law (e.g., revenues from patients covered by the Medicare program). In lieu of assignment of such payments, unless otherwise prohibited by law, Group shall remit to Manager the amount of any such sums within five (5) business days of Group’s receipt thereof. Group and Manager shall cooperate in the establishment of a separate account or accounts to track all such amounts. In connection with its billing activities, Manager may take possession of, and endorse in the name of Group, any and all notes, drafts and other instruments received by way of payment. Manager shall assist Group in negotiating or otherwise communicating with any patient or third party payor regarding claims processing and any disputes arising therefrom. (ii) Bank Accounts. Manager is hereby granted a general power of attorney with respect to the bank accounts of Group and shall have full access to and signatory rights, with Group, over such bank accounts. Manager shall have full power and authority to deposit funds into, and withdraw funds from, all such accounts in accordance with the terms of this Agreement; provided, however, that Group may impose such limitations upon Manager’s signatory rights over such accounts as Group shall determine from time to time, in Group’s sole discretion. Manager shall have full authority to receive and transact on behalf of Group all cash, checks, drafts, notes and other instruments tendered as payment for professional services rendered by Group, except as may be precluded by law. (g) Insurance. Negotiating and securing appropriate insurance coverage on behalf of Group and in connection with Group’s Practice, after consultation with Group, including coverage for malpractice, comprehensive general liability, fire and premises liability, worker’s compensation, business interruption, and such other coverage as may be agreed from time to time between Manager and Group. (h) Worker’s Compensation, Etc. Preparing and filing all forms, reports, and returns required by law in connection with unemployment insurance, workers’ compensation insurance, disability benefits, social security, and other similar laws now in effect or hereafter imposed. (i) Premises. Managing the proper maintenance and physical operation of Group’s medical practice premises (“Premises”). Group’s medical office lease(s) are listed on Exhibit A, which is attached hereto and made a part hereof. (j) Clerical Support. Providing reception, secretarial, human resources, transcription and clerical personnel and services, including management of the maintenance of medical records. All Manager personnel shall be acceptable to Group in its reasonable discretion and shall be appropriately trained and supervised for the duties assigned to them in connection with Group’s practice. (k) Advertising. Marketing of physician services to hospitals, and otherwise coordinating advertising, marketing and similar activities conducted on behalf of Group, after consultation with Group. (l) Capital. Consulting with Group regarding capital and financial needs, including seeking capital, undertaking the efforts to raise, and providing access to, capital for any lawful purpose, including without limitation working capital, acquiring other physician practices and acquiring other business assets of the practice. (m) Contracting. Manager shall assist Group in setting the parameters under which Group will enter into, and in negotiating, contractual relations with hospitals and third party payors. 2. Performance of Manager’s Services. (a) Manager’s Availability. Manager shall devote its best efforts to carrying out the terms of this Agreement and shall devote sufficient time and resources, as determined by Manager after consultation with Group, as is reasonably required to discharge its duties under this Agreement. (b) Manager’s Authority. Manager shall perform all additional and ancillary services, not otherwise described in this Agreement, that may in Manager’s judgment, after consultation with Group, be reasonable and appropriate in order to meet Manager’s obligations under this Agreement. Manager may subcontract with other persons or entities, including entities related to Manager by common ownership or control, to perform all or any part of the services required of Manager by this Agreement. For purposes of this Agreement, Manager shall have signatory rights on all bank accounts used by Group in the conduct of Group’s Practice, and Manager shall have the right to make deposits to and payments from such accounts as it deems appropriate in furtherance of its obligations hereunder, in accordance with Paragraph 1(e)(ii) (Bank Accounts). (c) Manager’s Responsibility. In all matters under this Agreement, Manager shall abide by all applicable state and federal laws and regulations, and applicable policies and procedures of Group. (d) Reports to Group. On or before the twenty-fifth (25th) day of the first month of each calendar quarter, Manager shall provide Group with an accounting of all billings and collections on behalf of Group, and all deposits to the account(s) of Group and payments from the account(s) of Group, effected by Manager for the benefit of Group during the immediately preceding calendar quarter. All reports shall be in such form as may be agreed between Manager and Group from time to time.